THE ADDRESS CHANGE: Oh yeah, due to the ever increasing volume of spam I’m getting (and having my address hijacked by spammers) I am changing my email to brianblain@brianblain.ca. blain@tojazz is still fine Please update your Blackberrys or whatever device you use. THE PITCH: There is no dignified way of saying this, but if you are a festival director, I am still looking for some dates in July and beyond. 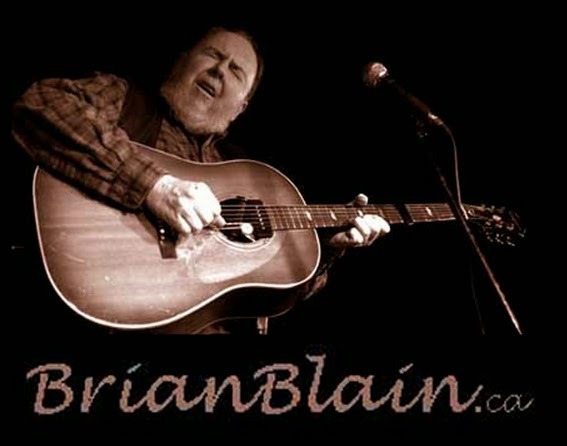 A couple of festivals have booked my blues band, "Colorblind Brian and the New Blainettes" but at this point I can be a solo, tweener, whatever gap you might need to fill. In French you could call me a "bouche-trou." I'm fun, I'm bluesy, I'm bilingual. Hire me. End of commercial. THE APOLOGY: If you have received this Blainletter on a listserve like MaplePost or MapleBlue, I don't mean to spam you. It's only because a certain listmom/friend has accused me of being too "shy" so I am sending this one-time-only e-blast to the world. If you would like to continue receiving the Blainletter, then please replay to this with the word “subscribe” in the subject line… and Welcome to Blainville! Some find it to be entertaining commentary - I send out once a month or when I can manage. My night in Toronto: As I was typing away this blog, I realized there was some music I wanted to see tonight so at 10pm I jump in the car and head straight over to Clinton’s to hear Montrealer Rob Lutes. Rob delivers a great show, some great originals and well-chosen covers. One tune I thought right away sounded like Chris Smithers and sure enough it was one of his tunes. Then he did a cover of “That’s How Strong My Love Is” and even a credible version of “Wichita Lineman” His long-time guitarist, Rob Macdonald was in fine form, getting applause at the end of every solo (and sometimes in the middle of a solo!). Rob had a great sound and I asked him after what kind of guitar/pickup he had. It was a wood-body resophonic. I think he called it a “Listell” I told Rob if was heading down to Healey’s to hear Garrett Mason, and he said he might try to get down but I realized as I was driving away that he probably thinks Healey’s is still at Bathurst & Queen. Well even if he headed straight down to the new place, he would have missed the show – as it was I only heard the encore (but it was rockin’). Then I stop at a 7/11 on the way home, I park next to a small car with a dark, mysterious woman at the wheel. When I come out, she has rolled down the passenger and call’s me over to get some directions. When I approach, I realize she’s pulled down her shirt to expose some pretty massive breasts. She says “Do you live alone?” I said something like “Lookin good but not tonite…” and got back in my car but I guess she took that as some kind of encouragement because she pulls out right behind me and start to follow me. At the red light, she pulls up alongside still flirting, I make a left, and she cuts across the lane to keep following me. Yikes, I’m being stalked. I speed up up and she speeds, finally I see my chance and I race towards a light that is about to change and make a quick left and finally I’ve lost her. That was pretty exciting. I think I owe her a few bucks just for that little thrill! Other Music around Town: Since getting back from Memphis last month, it’s been non-stop music. I know, I know, I should be home working on my own music, but when you’re a part-time media mooch like myself (I mean, desktop publishing mogul) you get invited to so many CD launches and great concerts. In addition, my boss has opened a new club which is destined to be THE showcase room for jazz in this city, and the whole country for that matter. The opening was packed with high-rollers and beautiful people. Since then I’ve been a few times to hear some local jazos and the wonderful Roberta Gambarini. Then I took Jacquie to the Johnny Winter show (yes, this is the same Jacquie that screwed up the Blueslink listing in the MapleBlues). Jacquie had always wanted to see Johnny Winter and even though I heard that Johnny was not in great shape, I was glad for the opportunity to see him again since the only other time I ever saw him was at a rock festival at Varsity Stadium in 1970 (??). It was the most dramatic entrance I’d ever seen anyone make. The announcer had already yelled out “Johnny Winter!” a name that meant nothing to me, but then I heard a searing slide guitar intro, but there was only a bass player and drummer on stage. Then after another minute or so, he appeared from the side of the stage, resplendent in satiny black outfit with flowing white hair, playing a burning slide lead on a 12 string electric guitar. I’d never seen slide played on a 12-string and still haven’t to this day. Now it’s 35 years later, I’m standing by the side of the stage as his drummer does the intro after they’ve played a couple of tunes with a guest guitarist. Then I see Johnny being led in through the back door, directly up to the stage where he is placed in a chair with a cushion taped to the seat with duct tape. He walked like a little old man and his arms were so thin. My comment to those who asked was “He can still play” but the fire was not there. He chose a lot of very predictable blues standards to start – it made you wonder if this was just a pick-up band. One friend who’s band had opened a bunch of shows for Johnny a few years back asked if he had occasionally shifted keys in the middle of a song, and I do believe that happened once or twice. It was hard to watch the senior version of someone who had been just about the most glamourous figure in Rock and Roll at a certain moment. But “he can still play” and he can still pack a club. Good for him. Downchild had a big CD launch of their live album at the new Healey’s and they rocked the house. I was at the gig they recorded – it was at the Palais Royale, where I’m headed in a couple of days for the National Jazz Awards. I also saw two of the great blues touring acts from the west coast, Coco Montoya and Mark Hummel (with Rusty Zinn). Some great guitar playing, and I want a hat just like the one Mark Hummel was wearing. Canadian Music Week kicked off with some interesting speeches (from record pioneer Jac Holzman and rapper Chuck D) and was followed with three nights of music that is all just a blur. I remember young Liam Titcomb did a great showcase and played some tunes from his new album – I hope it gets out pretty soon, it’s been in the can for a while. I told Liam that I had reworked the song I was pitching him back when he was writing his first album and that I was now performing it myself. I still want to play it for him one of these days. It’s called “The End of September” and it’s a “first-day-of-school” scenario. I remember when I was describing the tune to one of Liam’s songwriting pals, she said she questioned whether Liam would be interested in that “schoolboy” thing. She’s probably right, but if I’d got it to him back when I thought of it (of course, it wasn’t finished at that time). This reminds me of my song about New Orleans. When a promoter friend said he was involved in a benefit concert for the victims of Hurricane Katrina, I told him I was writing a song for the occasion. Still, I didn’t make it onto the bill, and it’s just as well, cause I’ve only just finished the song. Then there were a couple of events that I attended just briefly; the Lula Lounge celebration for CBC’s Global Village program and The Indie Awards. One lasting image of Music Week is a bare-chested guy with eye make-up jumping around the stage like a chimpanzee and making weird gutteral sounds into the mic. I didn’t stick around for the whole thing but I discovered after that they were a group from Montreal called Les Breastfeeders and that they are “the next big thing” (in Europe, at least). I got to Memphis too late for the opening press conference so I missed hearing Buffy St-Marie who made a huge impression on everyone who heard her keynote address (I had a bit of a breakthrough when I opted to stay in, check out my gear and prepare for my showcase rather than go to the keynote). Maybe I should have just gone to hear Buffy because there were only five or six people at the showcase anyway, though it was an audience many of those showcasers would have killed for - Rounder founder Ken Irwin and wife Donna Wilson Irwin whom I've known for years and who were just there supporting a friend). Rather than play my prepared set, I pulled out some tunes I've never played in public including "Last Time I Saw Lenny" (Breau) and "Alice," a where-is-she-now ballad about Alice Brock, the subject of the now 40-year old "Alice's Restaurant." I've reworked the tune since Alice told me it wasn't her favourite Brian Blain song and that it wasn't exactly a "toe-tapper." I didn't feel so bad about having just a handful of people at my hotel room showcase when I walked by many "official" showcases in much larger spaces with even fewer listeners – in one case, I was the only person in the audience which was pretty awkward for both of us. Then there was Rory Block's show on the Martin Stage. Rory is a blues headliner and probably got a nice fee from Martin Guitars (the better to pay the gas in her giant tour bus…I think it was hers, anyway). The Martin Stage was in a cavernous space in the convention centre outside the trade show area (double cavernous). There was hardly anybody seated up by the stage though there were lots of people wandering around in the distance. I gather from his recent post that the guy sitting a few seats from me was Steve Edge – hey Steve, if I'd known it was you I would have said hello! That was a thankless gig but Rory dug in and put on a show for anyone who cared to listen. She talked about her early days as a teenager touring the rural south with Stefan Grossman telling how he would stop in at every pawn shop and ask if they had any old Martin guitars. Many times the pawnbroker would pull out a banged up pre-war Martin and Stefan would get it for 40 or 50 bucks. When they returned to New York, he had accumulated ten or more of these priceless guitars. We can only imagine what they're worth today. I slipped away from Rory's set to make my way to the Blues Workshop where I found Ann Rabson (playing guitar, which she pointed out was her main instrument long before piano). Also on stage was William Lee Ellis who I met earlier in our showcase room. I found out later that he is a prominent music writer in Memphis and he did the "celebrity interview" with Jesse Winchester. He's a great finger-picker too – I was watching carefully. There was a very small audience in the Blues workshop (I guess Steve Edge was there too) and the players opted to turn off the PA system, which was fine until the banjo workshop (amplified) got going in the adjacent room. Following the Blues workshop, we had a blues jam and I joined in. Ken Whiteley and Alice Stuart were the hosts though Alice hardly played and split early. Apparently she is one of the first women on the blues circuit to play lead electric guitar and has been out of the scene for a while. Regrettably, I never got to see her doing a showcase. Ken was coaxing me to play Ben's electric string bass but I tried for a moment and realized it's been way too long (like 45 years). Maybe with a little tape to mark the positions I might have tried it, but it was just too strange. At the same time as my showcase, the Quebec contingent were having a showcase with Penny Lang, Ray Bonneville, Jesse Winchester and others. I missed it, of course, but I had the privilege to tag along for a recording session with Penny and Ray and the legendary Sun Studios. Now there's a studio with some history. The front area had been converted into a souvenir shop and the upstairs was a veritable museum but the studio itself was pretty well the way it was when Johnny Cash, Elvis Presley and Howlin' Wolf had recorded there. The equipment was not the same, though. There were a few old tape machines hanging around for décor, but the control room featured what many would consider "semi-pro" gear. Regardless, they laid down some great tracks and Penny loved that classic Memphis "slap-echo" on her vocal. I hope they get to use some of these tracks on her next album. Penny is a true national treasure and Ray Bonneville is a road warrior who lives to play. At the Awards soiree, I got to see a phenomenal kora player, Mamadou Diabate – tall, elegant and an amazing player. I've had a kora in my living room for months but have not got to first base. I had decided to bring my Johnson resophonic rather than my beloved Epiphone guitar but as I looked around I could see that everybody else brought there finest and most treasured instruments. I've seen a lot of old Gibsons, but I don't think there's ever been such a collection of "banner" Gibsons, the really old ones, under one roof. Interesting that everyone was so concerned about getting the best sound from their guitars with the state of the art pick-ups and pre-amps but I think the best sounding guitar I heard all week-end was Jesse Winchester's classical guitar with no pickup. He just pulled a mic in front of it and it sounded so full and beautiful. Maybe I was caught up in the emotion of the moment – Jesse had just been honoured by the greatest musicians in the country at a special ASCAP reception and he played a few songs for the large crowd. I spoke to him briefly but I'm not sure he remembered me. Thirty-five years ago we worked for a couple of weeks as co-producers of the second Fraser & DeBolt album but Jesse bailed on the project when things were getting too loose for his liking. I wanted to reminisce with him about when he first arrived in Montreal and I remember getting a call from Sue Lothrop telling me that she and Allan Fraser (then performing as a duo called "Breakfast") were going to pay the musicians' union initiation fee for this great guitarist who had just arrived in Montreal…that was Jesse, of course. I was their manager and forbade them putting out that money for Jesse when there were many other great guitarists who were already in the union, but we can all be glad they disregarded my fiscal concerns and went ahead and got Jesse in the union so he could play the gig with them (I think it was at the Venus de Milo Room). I'm looking at the list I made of artists I wanted to see, but alas I hardly got to see half of them. I didn't get to hear Digging Roots with their new band lineup, but I heard lots of great comments. Raven was the first familiar face I saw at the hotel and then we ran into each other on Beale Street. The Canadian contingent fared very well. New Brunswick's Hot Toddy were rocking the "East Coast" room. I overheard one attendee talking about Andrew Collins of Creaking Tree String Quartet "After a week-end of listening to mediocre mandolin players it's a relief to hear someone who can really play". I went out for breakfast with Australian Jeff Lang and he was trying to remember the name of some high-energy duo from Canada that knocked him out. "The Undesirables?" I asked. "That's it," he said, and asked me to repeat the name again later. My faves were the Lovell Sisters, the Illuminatti Orchestrii from the Bronx and a crazy trio of gypsy-style performers from Australia called Vardoz. I heard a young Nova Scotian guitarist whose last name was Leblanc. I've got to hjear more of him. The Carolina Chocolate Drops were the buzz of the weekend and they had a great shtick but I wondered how it would sustain for a whole evening. The best moment of the whole week-end for me was one of the groups that played right after me in the Rolling & Tumbling suite. They were an gospel quartet (actually five elderly black gentlemen wearing dark suits and matching ties) called the Spirit of Memphis. They performed a capella and stated proudly that the group has been in existence 77 years and it was a most uplifting performance. I sat mesmerized in a big armchair right in front. To the left of me was music industry pioneer Chris Strachwitz filming the performance on his camcorder and next to him the renown musicologist Dr. David Evans. We saved the best for last and late Saturday Night the jamming began. First Michelle and I set up in the lobby mezzanine and attracted Eivor and Bill Bourne (man that guy really has something all his own, and Eivor is a vocalist nonpareil), then we made our way up to a room where I had a quickie jam with Ken Whiteley and played him my song-in-the-works about New Orleans. Finally (at about 3am) many of the Rolling & Tumbling participants gathered in our suite for an informal jam and we were all delighted when David showed up with legendary bass player Freebo who lays down a real solid groove. We had a room full of guitar players but it did not get out of hand at all and some great moments were had. I don't even know all their names, but the group included David, Michelle, myself, Freebo, Jonathan Byrd, David Glaser, Steve James, Greg Klyma, Andy Cohen and Spook Handy. What a pleasure jamming with these great musicians. That's what it's all about for me.